Svaneke Bryghus (website in danish) really annoy me ! Most of their beers are just mediocre to above average for me and I always get the feeling they could be so much better if they were not brewed for an exact retail price. A couple of years ago they had a Session Pilsner in their range which, excuse my french was f*****g fantastic, yet it cost a few kroner more which when getting a beer like that I certainly did not mind. 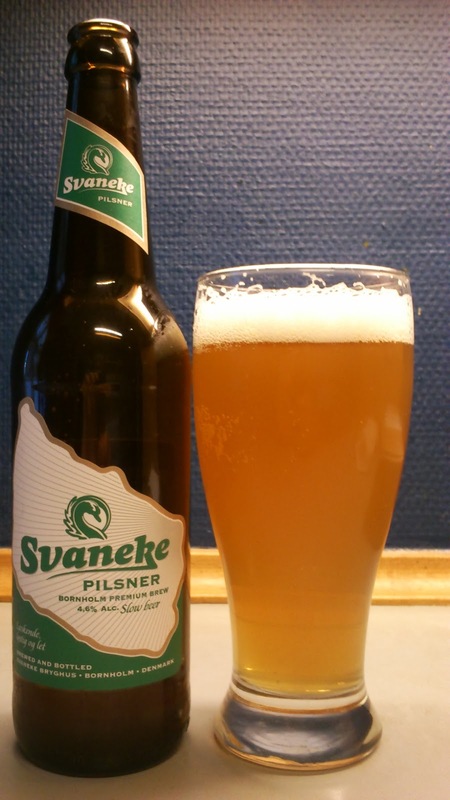 Now it is gone from the range and the only time I think about Svaneke is when christmas comes around as they still make a decent christmas beer or two. So Svaneke, pull the smoked herring out from your asses and re-release the Session Pilsner, please ! Malt, hops and grass in the light aroma from the pour though not a lot going on. Pilsner pours a cloudy yellow gold with a frothy white head. Malt, bread, hops and touch of caramel on the lightly sweet intake while it has quite a dry finish with mild bitterness. The aftertaste is smokey malt and fruit. It has a light mouthfeel without being watery. Well well well, this was a lot better than I expected. Having tried this one before a good while back I wonder if there has been a recipe change. Although it is not mentioned anywhere this is a very German tasting pils. Very easy to drink though I guess the hot weather is helping. I have no problem buying this again or drinking a few on a session. Summing up, a bit of a surprise for no money as it is on offer this week at half price. Decent above average Danish pilsner that I have no gripes over. This scored 6/10 on the 'I'd still have have a Session Pils, please re-release' Beerometer. Where to buy CPH : All larger supermarkets.